How Can We Bring an End to This Slaughter of the Innocents? Recently, New York City clergy gathered to address 90,000 deaths that happen there each year, deaths that go unnoticed. That's the number of pregnancies ended by abortion in New York each year, a figure that represents 40% of all pregnancies in the city annually! The figure in the United States is about half that, but still haunting at 22%! Increasingly, ours is a violent society that believes it can simply kill off its problems. Abortion is one element of our violent culture. So too are our popular video games, music, and films which glorify bloodshed, nihilism, and misogyny. So too are our indifference to the hurts of others and to the agony of gun violence. So too, are the violence of a crass culture that urges us to depersonalize those with whom we disagree and that lionizes reality show figures whose only virtues appear to be narcissism and a willingness to mistreat anyone inconvenient to their personal aims. The Bible understands that there may be times when killing is a necessary and horrible option in human interaction, as when defending one's self or loved ones. But murder, the willful ending of another person's life simply because that person's continued existence doesn't suit us, is indefensible. Jesus says that we murder others when we insult or hurt them, objectifying them, robbing them of their humanity. God takes our humanity very seriously. It's time we did too! I'm not addressing abortion or our culture of violence as political issues. Although I think that the ruling in Roe v. Wade was unconscionable and ought to be overturned, for example, overturning it won't change a culture that finds the disposal of unborn fetuses acceptable. The American culture of violence presents us with profound moral and spiritual issues. We resort to violence to impose our own wills on others, to be in control, to be gods. But there is only one God, revealed as the Father, the Son, and the Holy Spirit. He came to earth in the person of Jesus Christ and He calls us (commands us) to repent for our sins and to trust in Him alone, to love God completely, and to love others as we love ourselves. Surrendering to Christ as our God will bring the power of God into our lives so that we can think and act more creatively than we do when we resort to violence to solve our problems. How can this slaughter of the innocents end? It will not happen with new laws, constitutional amendments, or court rulings, laudable and appropriate as any of those may be. The end of the slaughter of the innocents will only begin when we hit our knees, repenting of our sins and asking Jesus Christ to make us new from the inside out. It will only begin when we surrender all to the One who formed as in our mothers' wombs and aims to have us live in a fellowship of love with God and others for all eternity. In Christ, we can be forgiven of our sins and we can be made new. Turn to Him and live. Then, share this new life with others. Please. The men featured in this article from the Columbus Dispatch, play pick-up games during lunch hours at both the Columbus Athletic Club and the downtown YMCA. Most inspiring is a 76-year old who plays in spite of previous bypass and heart valve surgeries! I'm 57 and, as some who read this blog know, I suffered from a heart attack that damaged 40% of my heart last summer. I subsequently received a stent inserted into a heart artery that had been 100% blocked. My heart function is improving, no doubt because of four major factors: medication that is strengthening the heart and reducing cholesterol (although my HDL, the "bad cholesterol," was never that high); cardiac rehabilitation, which, after I "graduated," has been followed by continued regular exercise; being a stickler for a heart healthy diet; and becoming more regular about daily Bible reading and prayer. God helps me to be both more calm and more deeply certain of His presence, will, and love for me through this latter discipline, incorporating time spent in His Word and in reverent conversation with God. Earlier today, I enjoyed the routine which the cardiac rehab techs taught me to use at home on those days I don't go to the gym: stretching, life weight-lifting, and a 45-minute walk. This is all helping me to get stronger. So, dare I hope that one day, I might be able to regularly enjoy playing pick-up basketball games like the guys in the Dispatch story? I would love that! And maybe, if I suddenly fall heir to an incredible amount of wackily-disposable income, I could do what a good friend of mine did last year about this time: Play with ex-Big Leaguers at the Cincinnati Reds Fantasy Camp in Arizona. Now, that would be über-cool! As strange as it may sound, God sent prophets of doom to his people because he loved them. He cares enough to say a harsh word to us because it is for our own good. It is not easy to say hard words to someone you love. Nor is it easy to be critical when you want to say nice things. But it is important to speak the truth. You cannot pretend everything is fine when it isn't. If friends are going to hurt themselves or someone else because of the way they live, then we should speak out. God did this through his prophets. The apostle Paul spoke about the importance of "speaking the truth in love." Some people erroneously think that pointing out sins that threaten themselves, their relationships with others, or their eternal destinies is the same thing as judging, something Jesus warned us not to do. Not true! The condemning judgments we express toward others are often done behind the backs of those we condemn. And when we judgeothers, if we do confront them, there is no desire to help them, only to prove them wrong (and by extension, ourselves superior). Love, the desire for what is best for another, even when the other makes us furious or when we find ourselves incapable of being around the other, is absent. By contrast, when we speak the truth in love, we do so with the other person and with a desire to help them. We do so, Jesus says in His mandate for conflict resolution with fellow believers, even with a willingness to come away from those confrontations proven wrong. Jesus has entrusted the role of both confronting congregants and the world for sin and for offering the grace of forgiveness and new starts available through Jesus Christ. We must not mince words on either God's Law or God's Good News, the Gospel. Love compels the Church to speak both messages, whether the world likes it or not. In this era when the denomination of which I am a part speaks with a garbled voice about things like the deity of Jesus, the truth of His virgin birth and resurrection, Christ's claims to be the exclusive means by which humanity enters into a relationship with God, the authority of Scripture over our lives, and the teaching of the Bible that sexual intimacy was created by God as a source of pleasure, bonding, and procreation for a man and a woman in a lifetime marital covenant, we must devote ourselves to speaking the Word of God clearly. The world may like a garbled message. It enables us to dodge God's truth, to replace our individual desires for God's will. But God refuses to be marginalized. God refuses to allow us to go to hell without a fight. If we won't speak God's truth in love, God will raise up other messengers who will. The very stones will cry out His truth! Some may be shy about speaking God's truth, however lovingly, because of an awareness of their own sins. But if you read the testimonies by and about the Old Testament prophets, you discover that they shared this very trait with you. God chastised Elijah for that prophet's self-righteous notion that only he was faithful among God's people. Jonah hated the foreigners God had called him to preach to and was ultimately forced to fulfill his call after God had him swallowed up by a great fish. Hosea wasn't keen on marrying a prostitute who he was sure would be unfaithful to him. The New Testament prophet John the Baptist, the one who whooped in the womb when his mother heard the voice of Jesus' pregnant mother Mary, doubted Jesus as the Messiah when he languished in Herod's prison before he was beheaded. The everyday prophets Christians are called to be aren't perfect either. They're willing to be proven wrong. But they are unwilling to see their friends, family members, or society turn away from God and the life that only God offers without telling them the truth about God's condemnation of sin and about God's gift of new and everlasting life for all who repudiate their sin and surrender their lives and wills to Jesus Christ. There is no question so out of line that you should not ask it. The people who wrote the Bible asked God some hard questions. They did not hold back out of fear that questions showed lack of faith or respect. They knew God wanted them to be honest with him and with themselves. There is no way you can grow in understanding or faith if you do not ask the questions that need asking. At the time of the exile in the Old Testament or the time of the crucifixion [of Jesus] in the New Testament, it was hard to see God at work in the world. There are similar times in our own lives. But the Bible tells us he is present, working with us, even in those difficult times when it is hardest to believe this. "So if you think you are standing, watch out that you do not fall." Those words from 1 Corinthians are part of what inspired today's installment of Our Daily Bread. Both the Scripture passages on which it's based and the piece by David C. McCasland are worth reading, pondering, and praying about. One of the primary temptations the devil, the world, and our sinful selves hold out to us is this notion that whatever goodness we may thing we possess is intrinsic to our own natures and personalities. But my observation is that the moment we think we're righteous, we're in deep trouble. No one is more prone to undertaking a whole passel of rotten thoughts and entertaining more poisonous thoughts than those who think themselves constitutionally incapable of wrongdoing. Hitler never second-guessed himself. Saint Paul did. Do those words make you feel a bit uncomfortable? Me too. Especially when I consider the enormous logs of sin I've often gathered in my own eyes, even in the three-decades-plus that I've tried to follow Jesus. "So if you think you are standing, watch out that you do not fall." "At the end of every day, starting when he was in high school, he would ask himself, in effect, What have I done to improve the lot of humanity?" "The root of Shriver's self-conception was as a lay Catholic who always tried to model his life after the ethics of Jesus as expressed in the Gospels. This has not been a passive pursuit. Always he was asking himself, Am I living my life as Christ would want me to? "What he derived from his faith was less the solace of Lord's presence, or the promise of transcendence in the hereafter (though he did derive both of those qualities from his faith) than a kind of mobilizing vision for action here on earth..."
Those are the words of Scott Stossel, biographer of R. Sargent Shriver, in a touching tribute to the one-time Peace Corps and War on Poverty chief who died on Tuesday. Shriver was one of my favorite political figures of the last part of the twentieth century, maybe because he was so not-political. He seemed never to calculate how to advance his own personal political ambitions. And, in truth, he didn't really have to do so. His brother-in-law, with Shriver's help, was president and after John F. Kennedy's assassination, he seemed to be the one Kennedy family member Lyndon Johnson actually liked. But, in many ways, both during the Kennedy and Johnson Administrations and afterward, Shriver behaved in ways I suppose most of us would have wanted to behave had we been given similar opportunities. In 1972, George McGovern chose Shriver to be his second vice presidential running mate after the first one, Missouri senator Thomas Eagleton, was disqualified for having earlier undergone shock treatments for depression. McGovern, just days before asking Eagleton to leave the ticket, had famously remarked that he was behind the Missouri senator, "1000%." Backpedaling so public and abrupt probably eliminated whatever minute chance McGovern might have had in a year when, no matter what Americans' misgivings about the Vietnam War, a "peace candidate" had no chance of becoming president. For McGovern, Shriver was a consolation prize. He had really wanted Ted Kennedy for his running mate. But Kennedy, just three years after Chappaquiddick, demurred. McGovern seemed to figure if he couldn't have a Kennedy on his ticket, the next best thing would be a Kennedy brother-in-law. During the fall campaign, Shriver came to the Ohio State University campus in Columbus, where I was a sophomore. Speaking on the west grounds of the old Student Union, Shriver proved to be an enthusiastic and joyous candidate, even though this was his first run for a major office. I stuck my hand through a throng of people to try to shake his. Without being able to actually see him, I'll never know, but I think he did briefly clasp my hand the way candidates do when moving quickly through a thrall of people. 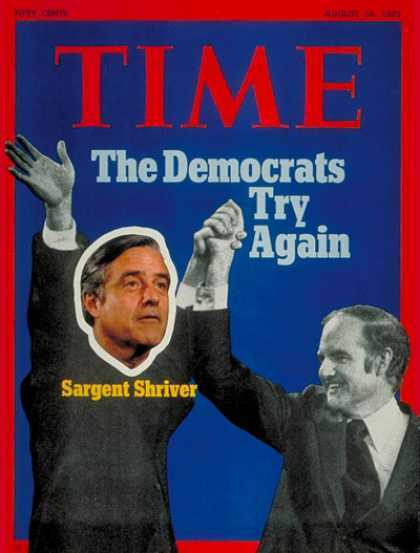 In the end, not even Shriver, with his compelling can-do attitude, could prevent the defeat, one of the worst in presidential history, suffered by the Democrats that year. Shriver made a brief bid for the presidency himself in the next cycle, but his candidacy never got much traction. A Shriver campaign button is among my modest collection of political memorabilia. No one knows what a Shriver presidency would have been like, of course. Except for this: He would have met the challenges with optimism and with that sense of joyous responsibility to others that were his trademarks. Ambrosiaster, the designation given by Erasmus to an unidentified Church Father active sometime between 366 and 384AD, is considered by many to be the most insightful, accurate commentator on Paul's writings in the New Testament before the commentaries of Martin Luther (1483-1546) and other sixteenth-century reforming Biblical scholars came along. Ambrosiaster is cited in an entry for this coming Sunday's second Bible lesson, 1 Corinthians 1:10-18, in Ancient Christian Devotional: A Year of Weekly Readings, Lectionary Cycle A.
I wish that contemporary Christians would all read these words, an encouragement to those who adhere to a reverential view of the Bible and a correction to those who regard the central teachings of Scripture (and the confessions of the Church) as optional. Ambrosiaster also affirms the power of the Biblical witness without additions or subtractions on the parts of those trying to make the Gospel more palatable to unbelieving or skeptical people. It was because Christian preaching does not need elaborate refinement of verbal expression that fishers, who were uneducated, were chosen to preach the gospel. In that way the truth of the message would be its own recommendation, and it would not depend on the cleverness or ingenuity of human wisdom. The false apostles were doing just that, and moreover they were omitting the things which the world does not believe, like the virgin birth of Christ and his resurrection from the dead. Recently, my wife Ann was asked by a friend about what is going on in Haiti, where our son, along with his girlfriend and others from the congregation of which they're a part, plan to go to work with children at a vacation Bible school this coming summer. "Why do you suppose that country can't get things together in spite of all the help they're getting?" Ann was asked. Massive poverty, massive destruction after last year's earthquake, and a long history of political corruption and despotism were all reasons Ann cited. And, she added, that one can't discount one legacy of Voodooism in the country's troubles: demon possession. "You don't believe that?" the other person asked Ann. "Of course I do," she said. The fact that the Bible teaches about the existence of demon-possession and that Christ, Who cast out demons, believed in this phenomenon, should be enough to convince any Christian that demons do wreak havoc in our world. But so should experience. As a young pastor, I participated in a weekly study with a group of pastors that included Mennonites and Lutherans. One Lutheran clergy about a decade older than me said that he had never believed in angels or especially, in their fallen counterparts, demons. An older Lutheran colleague, who was far from being a Biblical fundamentalist, shocked the first pastor by saying, "If you don't believe that there are demons, you either haven't been paying attention or you're naive." But if we approach the Bible and Christian faith with a willingness to believe, a willingness to trust in God and in God's Word, we might find God not only constructing faith in our lives. We might well conclude that faith in the God revealed in Jesus Christ is the only thing that allows us to make sense of our world or ourselves. All that and heaven too. What a deal! What Gave the Life of Martin Luther King Jr. So Much Power? "12Indeed, the word of God is living and active, sharper than any two-edged sword, piercing until it divides soul from spirit, joints from marrow; it is able to judge the thoughts and intentions of the heart" (Hebrews 4:12). On the House floor. What do you think of that? Illinois has raised its income taxes. Is the State Legislature crazy or are they onto something? The jury's out, but read the whole thing and render your judgment in the comments section, if you wish. Second times around when the first rounds were long and wonderful. And why there's hope for the future. One of the problems people living in 2011 have when we read the Old Testament book of Isaiah is something the literary critics call its richness. Unlike most of the things we read each day, in any given passage of Isaiah, there may be words about more than just one thing. Sometimes, a passage may be about three things at once. It confuses us. Let me explain. Last Sunday, I mentioned that tucked among the promises Isaiah received from God about ancient Israel’s impending release from slavery to the Babylonian Empire, were promises about the Servant Who would be sent by God to free more than just Israel from humanity’s greatest enemies: sin, death, and futility. The Servant would come to set things right for all who would welcome His rule over their lives, including you and me. There are four "Servant Songs" in Isaiah. Today’s first lesson is one of them. As we consider this passage, along with our Gospel lesson for today, I want you to keep the image of an hourglass in your mind. It may help us to understand some of that confusing richness we encounter in Isaiah this morning. When you stand an hourglass on end, it’s wide at the top, tapers to a narrow shape in the middle, then widens out again at the bottom. If we mapped God’s mission to bring humanity new life, from say, the moment He delivered Israel from slavery in Egypt about 1000 years before Isaiah, followed it through Jesus some 600 years after Isaiah, and then to the Church today, our map would look like an hourglass. The top of the hourglass would be the descendants of Abraham, more numerous than the stars in the heavens, before the coming of the Servant. The bottom of the hourglass would be chock-full of those who are spiritual descendants of Abraham through their faith in the Servant foretold by Isaiah. Both ancient Israel and the Church of Jesus Christ were called to be God’s “light to the nations.” But, in a phrase used by Lutheran theologian Carl Braaten, “the flaming center” of history, the One Whose life is the light of the world, the narrow center of the hourglass, is Jesus Christ. All the voices that spoke for God before Christ was born pointed ultimately to Him as our only hope for forgiveness and life, the Messiah who would come into our world to set the lives of all who believe in Him aright. Jesus, the Servant Messiah, Who suffered and died to erase sin and death as powers over our lives and rose again to rend eternity open for all who believe in Him, is God’s ultimate self-expression, His Word of love and power and restoration for fallen people and our fallen universe. The Church is commissioned to share Christ’s light, to make disciples of Jesus Christ, and to do so by being completely focused on Jesus, the Servant King. The Celebrate introduction to our lesson from Isaiah that Ann read a few moments ago is right as far as it goes. It identifies the Servant as Israel, saying that in the lesson “the Servant Israel speaks for herself.” But that’s only part of the story. One of my favorite seminary professors, Tryg Skarsten, once recalled looking out onto a harbor at night. A large light, visible for miles, stood high over the harbor to guide ships coming in. Strung out into the harbor for thousands of yards were smaller lights. Each of them, Tryg said, were connected to the larger light from which they derived their power. Ancient Israel was God’s servant, of course, and it was a light to the nations. But it derived its capacity to be God’s servant and its power to be God’s light for the world from the true flaming center of life, “the Light of the world,” Jesus, to Whose coming Isaiah and other prophets pointed. Jesus, as the Gospel of John tells us, is “the Word of God.” He is God’s Word to you and me. The life, death, and resurrection of Jesus tell us that every one of our lives is of infinite value to God. God so loved you—you personally and individually—that He sent Jesus to take your punishment for sin so that all who turn from sin and take Him as the Lord and ruler over their lives, trusting their lives to Him, will have life forever with God. Will we take Jesus as our King as well as our Savior or will we oppose Him? 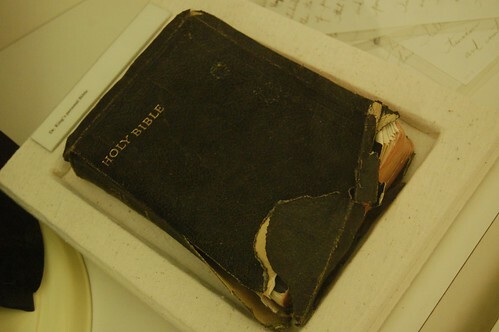 Will we trust or selectively ignore the Word of God in the Bible and the Word of God enfleshed in Jesus? Those aren’t abstract philosophical questions, but urgent ones on which our eternal destinies hang. True story: Santosh was a blacksmith in India. He was part of the Dalit, the untouchables, the permanent underclass who are denied access to food, housing, clothing, education, or health care. Along with most of his people, Santosh worshiped his Biskarma (the tools he used in his work), thinking that it was them that gave him life. And Santosh led a miserable life, wasting what little money he had on getting drunk. When he came home, he beat his wife and children, who dreaded his very presence in their home. One day, two missionaries who saw how troubled he was, invited Santosh to church. Surprisingly, the next Sunday, he took a place in the back of the sanctuary. The music was in his language and in a style he liked. Santosh kept coming back, intrigued by the word about Jesus sandwiched between this music he enjoyed. Eventually, he gave his life to Christ and wanted to share the Good News about Him with his fellow untouchables. With the missionaries’ help, he got a scholarship to study at a Bible college. The day before he was to leave for college, a large group of villagers confronted Santosh. They threatened to beat him if he didn’t return to the worship of Biskarma and renounced his faith in Christ. Santosh didn't back down, knowing that Jesus had saved him not only from sin and death, but from the meaningless life that had driven him to drink. After Santosh went to Bible college, the villagers threatened Santosh’s family and they eventually had to be moved to safety with him. Today, Santosh is the pastor of a thriving congregation that bravely (and joyfully) invites other untouchables to come and see and follow Jesus. Jesus is the Lord Who said that while we are saved by grace, He had not removed a single one of the Ten Commandments. If we show contempt for the commands in God’s Word, we also show contempt for Him Who is God’s Word. We cannot take Jesus as Savior if we don’t also take Him as Lord. We cannot be free of what enslaves us until we surrender to Christ the way Santosh did. Israel was not the incubator for the Servant Jesus just for itself. Through Jesus Christ, the truth of God’s love for all humanity and His offer of eternal reconciliation with God, would go global. And that’s where you and I come in. Simon, Philip, you, and I are all at the bottom of the hourglass of God's salvation history. We are the small lights ignited by the cross and empty tomb of Jesus and by the Holy Spirit with whom baptized Christians are filled. Our power for living comes from Jesus. Jesus tells us to “let your light shine before others, so that they may see your good works and give glory to your Father in heaven,” words we use in our Baptismal service. The Servant Jesus came to save a dying world from itself, to save us from ourselves. He invites all to follow Him, be reconciled to God, and live eternally. This week, this month, this year, be a light that helps others to come and see Jesus. God wants to fill eternity with people who have turned from sin and death and turned to Jesus for life and eternity. You are the lights God wants to use to guide others to the true Light of the nations, Jesus Christ. Jesus wants to fill His kingdom with those who have come and seen and believed in Him. Share Jesus with words and actions. Share Jesus with honesty, not as self-righteous egotists, but as forgiven sinners grateful for the grace of God. Share Jesus so that all the world will come and see what a wonderful God we have! Share Jesus so that all the world will have peace with God and with themselves today and in eternity.